Whether you’re inventive or prefer to stick to the classic combinations, there’s no doubt that a juicer is an amazing way to pack in as many of your five-a-day as possible. From detox juices to carrot juices and even the current trend, celery juice, there's no fruit or veg you can't liquidise in the right juicer machine. While keeping the pulp in when making a juice drink is in-line with 'doctor's orders' as it holds many of the nutrients, a juicer does the opposite, and separates the fibre from the fruit and veg to ensure a smoother result. However, it's a different ball game entirely if you simply just don't like juice with bits in, or you're using non-organic fruit or veg which will contain residues of agrochemicals. In that case, a juicer is ideal, as it'll separate those pesticides and herbicides from the finished product so that you don't consume them. Take a browse of our picks of the best juicers to help you pack in the vitamins. For more small kitchen appliance recommendations, check out our dedicated hub page. Price: juicers, because of their advanced technology, lean a little (or a lot) towards the expensive side. Be careful to consider style and performance when you select the best juicer for you. Power: high power doesn't necessarily mean better; some juicers may have several power settings, which is great if you're going to be using your juicer a lot and experimenting with different ingredients; that said, most juicers worth their salt should be able to handle even tough veg, such as raw carrots. Size: how much space do you have on your worktop or in your cupboard for a juicer? Some can be bulky so check the proportions when considering capacity. Capacity: it's worth considering how much juice you're going to be making at one time, whether it be one glass for yourself in the morning or a whole jug to serve the family. Can the juicer you're considering cope with family-sized portions? For smaller households, juicers such as the Braun Multiquick 5 Juicer are ideal for popping pieces of fruit through the juicer one at a time. Is it dishwasher-safe? It can be a fiddle to clean a juicer, so those with a dishwasher will be happy to know that the majority of juicers have dishwasher-safe parts, but always check before you buy. Centrifugal force or mastication? Probably not your first thought, but it's worth knowing if you want to ensure you’re left with a silky smooth juice to have alongside your morning bowl of cereal. Our list features two types of juicer - one that uses centrifugal force (think back to your science lessons on this one guys) and one that uses mastication – that’s mimicking the way our teeth chew to you and us. 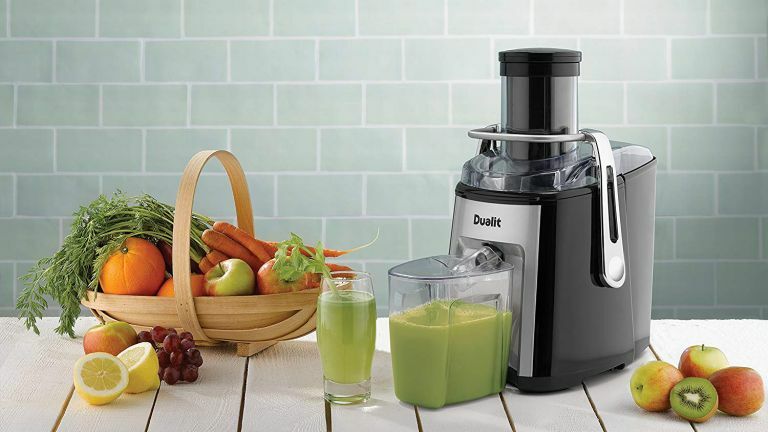 For maximum juice and minimal fuss, there's no other option than the Dualit Juice Extractor. You can fit an entire apple down the 85mm extra large feeding tube, and the two pre-programmed speed settings let you select the speed for hard or soft fruit or veg. Although the machine itself is big, it's for good reason; the pulp container can hold 2.2 litres of liquid so you can continuously juice without having to change it repeatedly, and it has a 'soft start' motor to reduce wear and tear, in turn prolonging your juicer's life. The best part, is that all of the pieces are dishwasher-friendly, meaning there's minimal washing up, and you can enjoy your juice straight away. We think this is the best juicer you can spend your money on. If you want a decent juicer, make sure you keep an eye out for the wattage, and this one has plenty. Combining power and innovative design, this machine has the capacity to juice anything from fruit with rind to spinach leaves. If you can’t leave for work without your morning juice, this juicer takes no less more than 10 minutes to grind up the perfect drink to a consistency of your choice. Once you’re done, remove the pulp then chuck all the removable parts in the dishwasher for easy cleaning. This centrifugal juicer neatly separates the juice from the pulp, extracting all the elements you need for a nutritional drink. With this machine, you can manage how much pulp remains in your juice, changing it up from clear juice to a thicker consistency that's more like a smoothie. It's another design with a usefully large feeding tube, meaning you can pop in whole apples (stalks removed) and other large veg, such as whole beetroot, allowing for time-effective juicing. It's dishwasher-safe, too, although somewhat bulky, so we think this is the best juicer for larger or family-sized kitchens. If you’re looking to get the most juice for the amount of fruit you put in, this juicer does the job nicely. While running slower than a centrifugal juicer, the way in which the device grinds and clenches the contents releases as much juice as possible without damaging the nutrients within it. If you like to juice wheatgrass and other fiddly ingredients like nuts, this machine does an efficient and quiet job of processing them. The kind of juice you create using a masticating juicer, for the juice pro, will have a slightly richer flavour and at this price, you really can’t go wrong. For those who are on a budget or can't see themselves digging out their juicer more than once or twice a month, this is easily the best juicer for you. You can throw whole fruit down the tube, as long as the skins you don't want to eat are removed, and it has two different settings: one for hard food and another for softer items. There's a removable 2.8 litre pulp container which is handily huge, meaning you won't have to keep emptying and changing it, and the best part is that it's easy to use. Our only complaint is that high starch or fibre content fruit or veg such as mangos and bananas are best left non-juiced, as the machine struggles with items which have low water content and it'll just clog the sieve, in turn making more of a cleaning job for you.